The International Monetary Fund has appointed Gita Gopinath as its new chief economist. Gopinath will be the first woman to direct the IMF’s research department when she takes over from retiring Maurice Obstfeld at the end of 2018. She is currently John Zwaanstra Professor of International Studies and Economics at Harvard University. 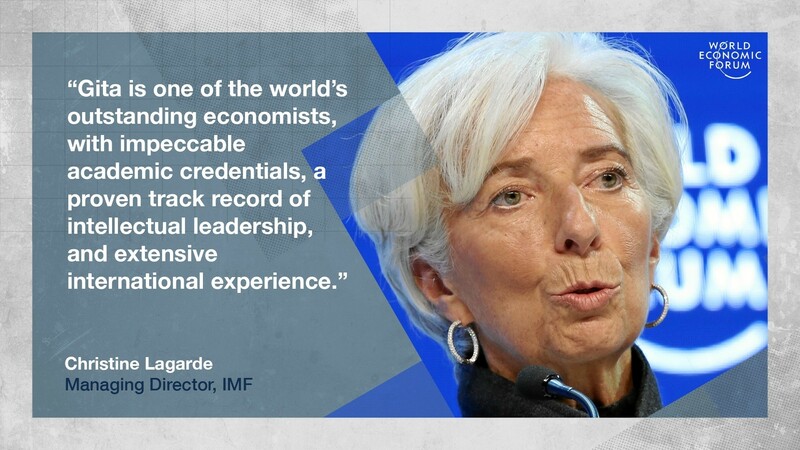 The IMF, OECD and the World Bank all now have women in top economic positions. Gopinath’s research focuses on macroeconomics and international finance, including exchange rates, trade, capital flows, productivity and debt. Many of the IMF’s 189 member countries are grappling with such issues, as they devise policies to account for global volatility while addressing social division and polarization within their own borders. Gopinath has opposed received wisdom on several of these topics, such as the benefits of flexible exchange rates. In a direct challenge the IMF, which has traditionally supported the idea, she believes flexible rates are less important than a country’s exchange rate relative to the dollar. Writing for the World Economic Forum in October 2014, Gopinath called on the IMF to tackle turbulence in global markets. “Rather than waiting for a crisis to erupt before intervening, the IMF should provide 'forward guidance' on how it will tackle potential disruptions in international financial markets,” she urged. Gopinath’s research has “tended to challenge conventional wisdom and push the collective thinking forward in a beneficial way”, Mohamed A. El-Erian, chief economic adviser at Allianz, told Bloomberg. While Gopinath was studying for her BA at the University of Delhi in 1991, India experienced a financing and currency crisis. She credits her country’s economic situation with inspiring her to pursue graduate work in economics, and for her particular interest in international finance. She holds MA degrees from both the Delhi School of Economics and the University of Washington, and a PhD from Princeton. “Gita is one of the world’s outstanding economists, with impeccable academic credentials, a proven track record of intellectual leadership, and extensive international experience”, said IMF Managing Director Christine Lagarde. Gopinath's “intellectual acumen will help the IMF better guide its member countries, especially developing countries, to deal with the complex economic and social challenges wrought by globalization”, said Eswar Prasad, senior fellow at the Brookings Institution. Gopinath also serves as Economic Adviser to the Chief Minister of Kerala, co-editor of the American Economic Review, co-director of the International Finance and Macroeconomics programme at the National Bureau of Economic Research, visiting scholar at the Federal Reserve Bank of Boston and member of the economic advisory panel of the Federal Reserve Bank of New York. She was a World Economic Forum Young Global Leader in 2011.